I have made this classic cheese ball recipe for years. But this year I am doing something special with it and making it into a Pine Cone Cheese Ball Recipe!! 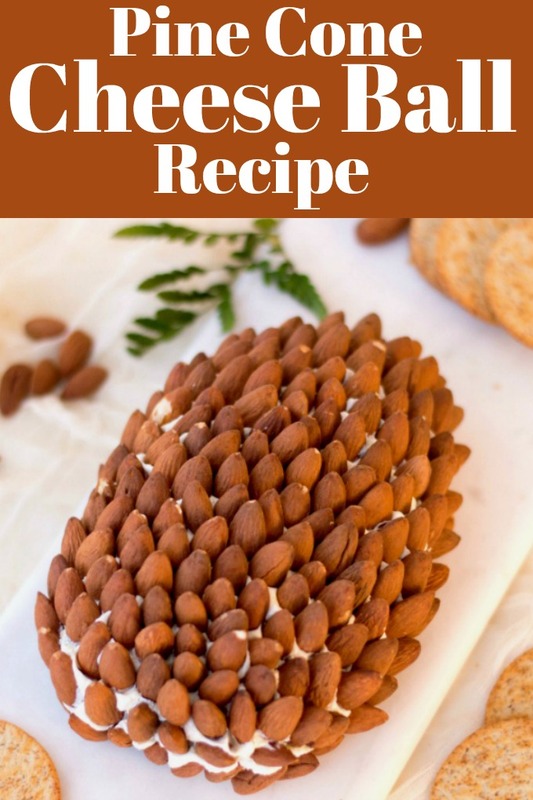 It is a perfect holiday appetizer for any holiday party!! My cheese ball has always been devoured. Years and years ago a friend of mine added “Serious” to my recipe, lol. Calling it a Serious Cheese Ball Recipe. He loved when I would make this for the holidays. 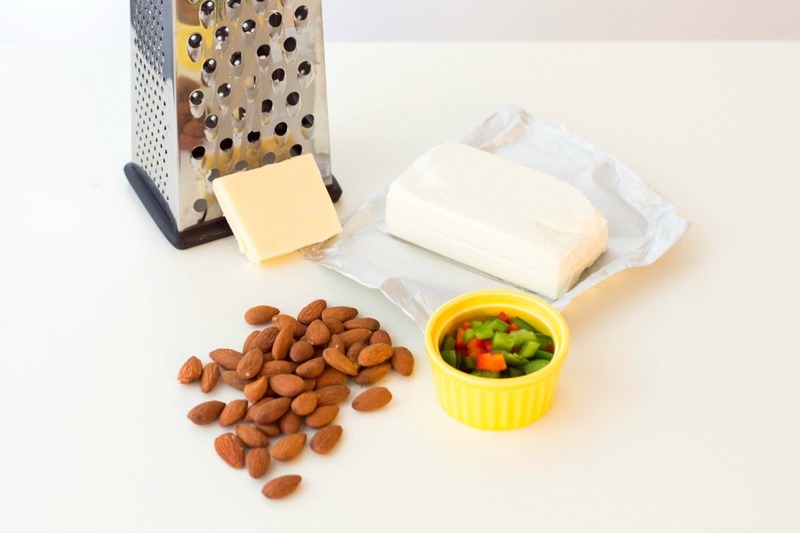 It is a super easy recipe and adding in the almonds is not hard either. Do you find cute cheese ball recipes intimidating? This recipe makes it accessible and SO easy to put together. This post contains affliliate links. 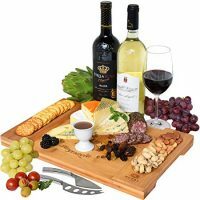 When I have made this before I have rolled the cheese ball in chopped pecans. 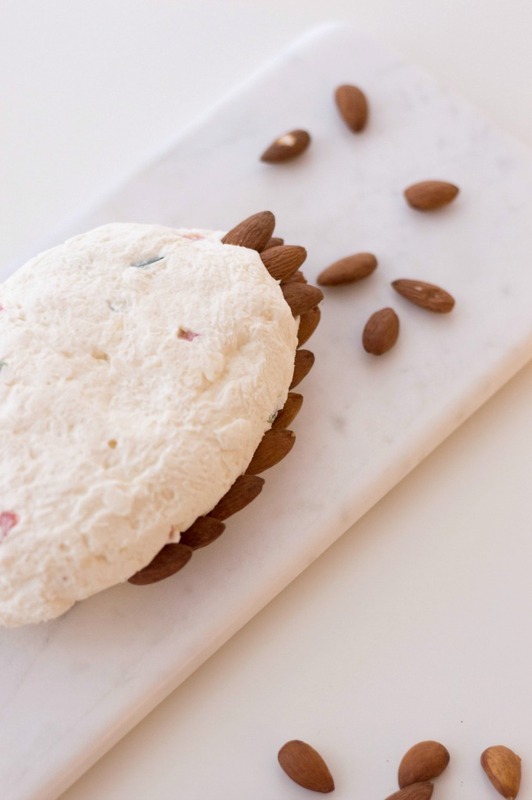 This cheese ball with the lovely change up with almonds is even better. I love how festive it looks. Using an aged cheddar cheese is the best for this adding in even more flavor. 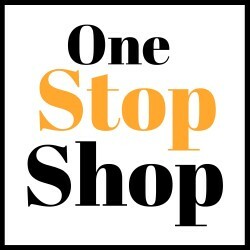 Fresh good quality ingredients will always give you better results too. The ingredients are pretty simple for this recipe. Instead of the chopped red pepper which you can surely use I almost always buy a small jar of pimentos. What is a pimento you ask? A pimiento, pimento, or cherry pepper is a variety of large, red, heart-shaped chili pepper that measures 3 to 4 in long and 2 to 3 in wide. The flesh of the pimiento is sweet, succulent, and more aromatic than that of the red bell pepper. According to Wikipedia. They are not hot at all but sweet and come in little strips in a jar so they can be easily diced up small or come already diced. This recipe calls for 2 blocks of cream cheese. You can use regular or low fat. Having it at room temperature is the best as you can whip it up much easier. Besides the cream cheese, cheddar cheese, pimentos and green peppers that we have already mentioned. I add in onion, worcestershire sauce, lemon juice and cayenne for some nice heat. You could also add in hot sauce if you like. Once all the ingredients are incorporated then forming the cheese ball into an egg shape and wrap in plastic wrap is easy. Store in the refrigerator for 2 hours to firm it up. When it is ready then place on a serving platter. 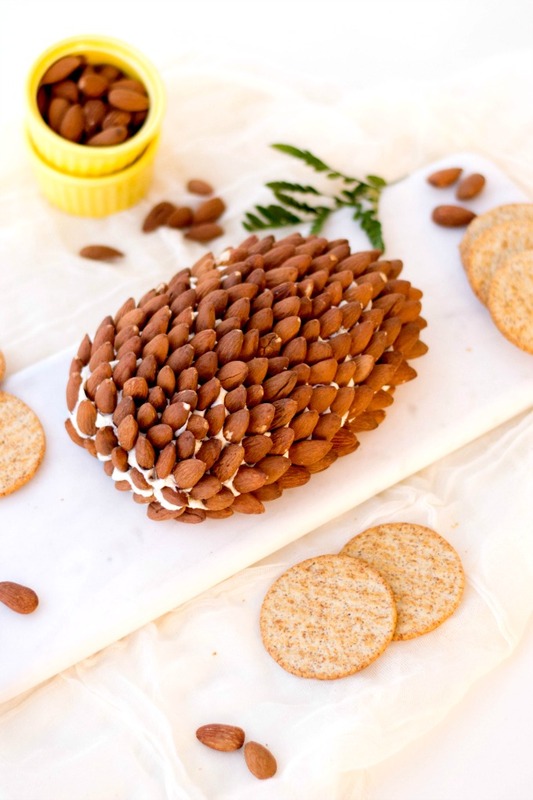 Arrange the almonds in rows on the cheese ball. Place them at an angle with the pointed ends sticking out. 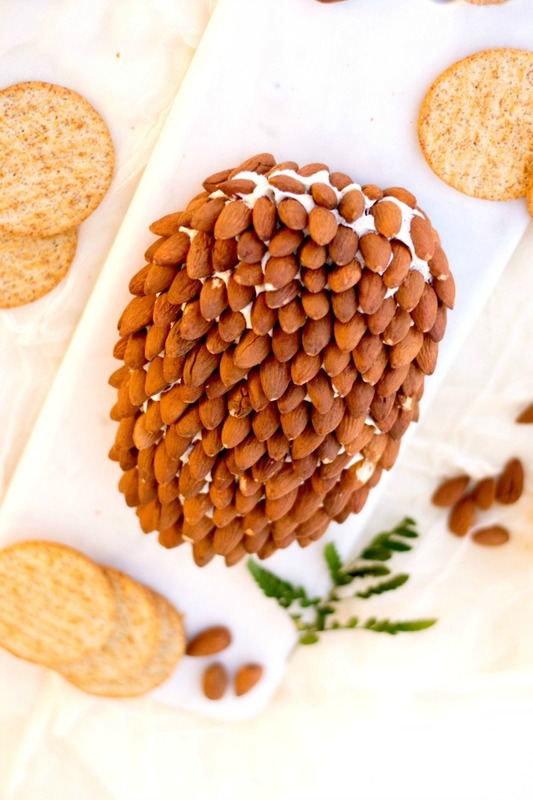 Hint, when placing the almonds, start by working your way around the cheese ball, creating a border. Then work row by row in the centre, with a bit of an arch to get the “pine cone” look. Serve the cheese ball with a nice sized cracker. There is nothing worse than trying to get a cheese ball onto a tiny cracker. It just will never work. 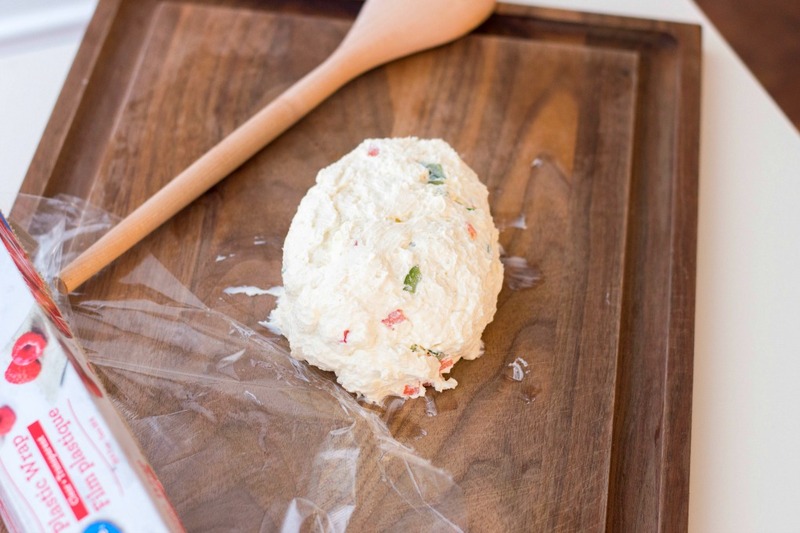 Young and old will love this cheese ball for the holidays. It is so easy to make and I don’t think you need the addition of sausage or bacon as some recipes say. Don’t mess with a good thing! I have been making this cheese ball recipe for decades now and it is always loved. Truly the best recipe and I am so happy to finally share it with you. After it is all assembled just put it back into the fridge and it is ready for when company arrive. A great make ahead recipe!! 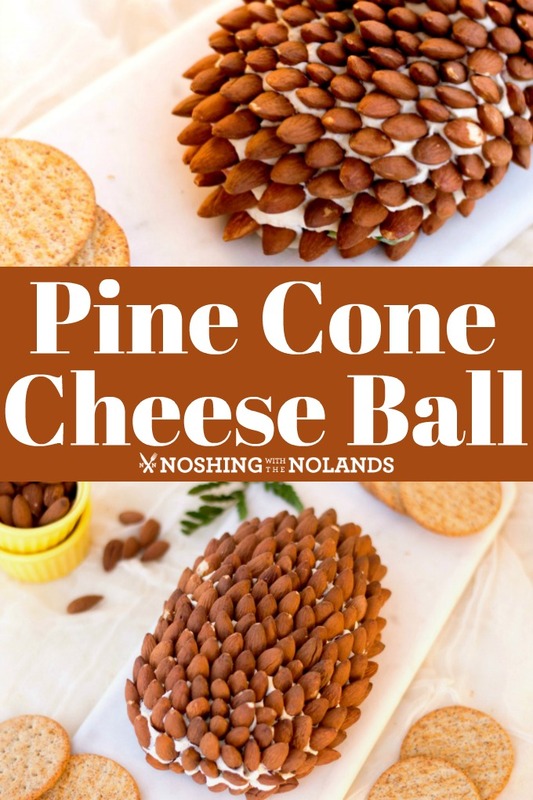 This Pine Cone Cheese Ball Recipe is perfect for a crowd for the holidays. It is easy to make, is ready when company arrives and tastes fantastic. 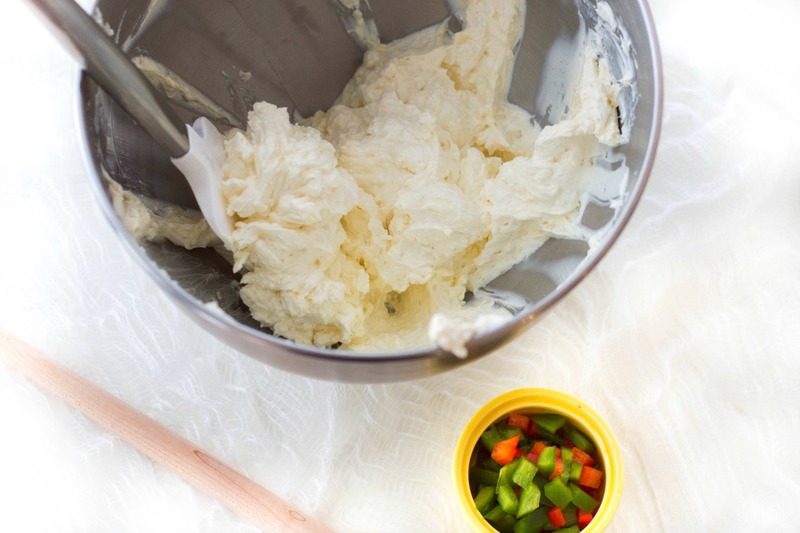 Combine cheeses and mix well in a standup mixer with a paddle attachment. Add remaining ingredients except nuts. Shape into an egg shape and refrigerate for 2 hours wrapped in plastic wrap. 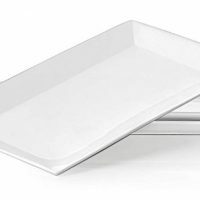 Place on a serving platter. 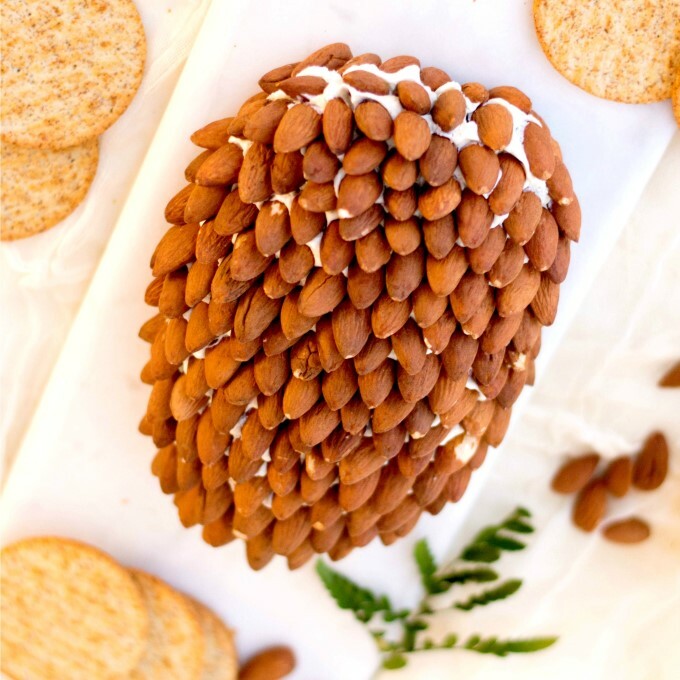 Arrange the almonds in rows on the cheese ball. 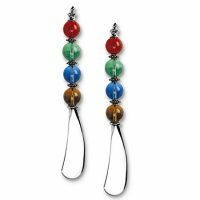 Place them at an angle with the pointed ends sticking out. Decorate with rosemary or similar leafy herb and serve with crackers. 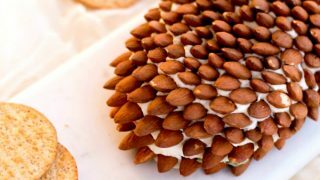 Hint, when placing the almonds, start by working your way around the cheese ball, creating a border. Then work row by row in the centre, with a bit of an arch to get the "pine cone" look. I love Pimiento’s I use them in my recipes. My family is from a Dutch origin and I think this is a perfect recipe to make when they come to visit. Thank you. This has to be the most creative cheeseball I’ve ever seen. 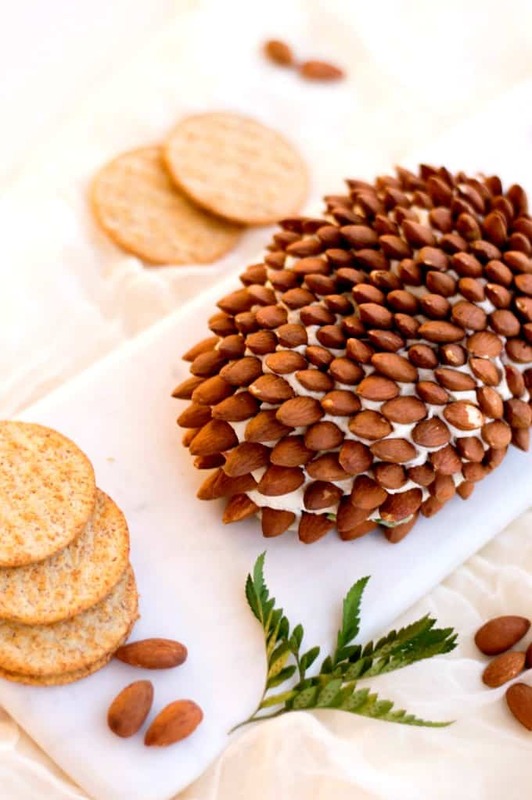 I love the use of almonds to make the pine cone look. 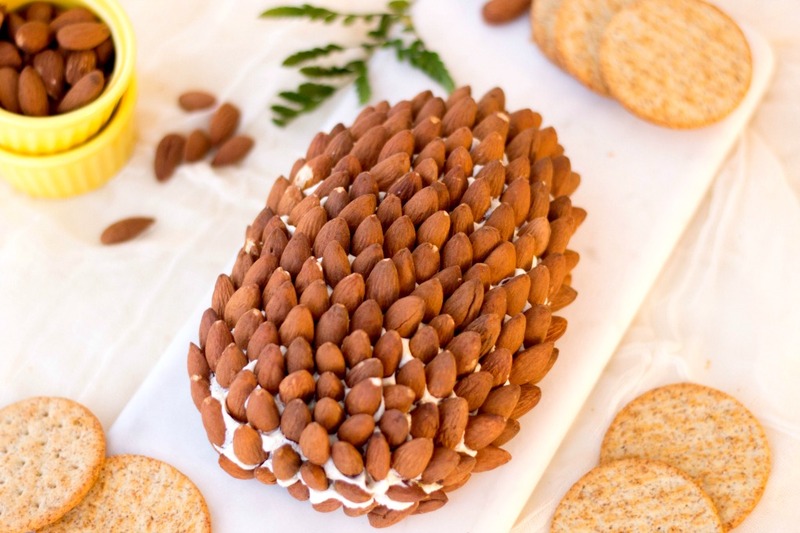 My mom used to make a cheese ball that looked like a pine cone. I think it’s so clever! My go to has always been a snowman but I make a dill pickle cheese ball and the green looks funny on the snowman. The almonds hide the green!!! But you know, now that I’ve seen your recipe with pimento in it, I might just have to try it instead! Looks tasty and also would make a great centerpiece! I love that you used whole almonds! This is such a clever idea for an app. I definitely like the look of it and cheese balls are good for when you have lots of guests. It’s funny but I love olives with pimento in it but I never knew what a pimento was. Also I’ve never seen a cheese ball with nuts before, an interesting twist. We make something almost just like this. 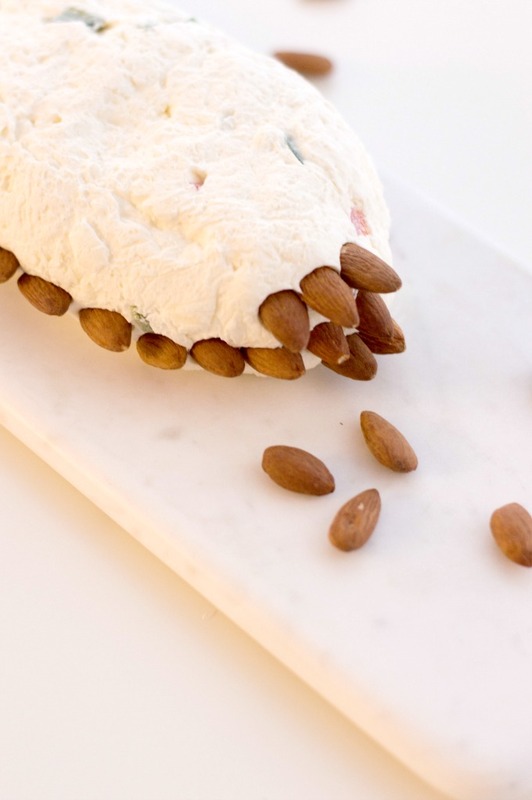 We use slivered almonds and it ends up looking like a dragon’s egg! How cute is this cheese ball. I love the idea of giving it a pine cone shape. It is so festive and delicious! What a beautiful display for a holiday spread! Looks really good! Cheese balls are one of my favorite appeitzers to make, Usually they are pretty easy and they are always a hit!